Sea Slug Easter Eggs For You! To follow up on last week’s posting about the feeding of giant nudibranchs, “Who’s eating who”, I now share images of the giant nudibranch swimming and of its egg-laying behaviour. I know that these are the strangest eggs you will see this Easter! The story of how the eggs come to be is pretty unique too. There are no girl or boy sea slugs. They are both male and female; they are hermaphrodites. This means that when sea slugs mate, both animals “get pregnant” and lay eggs. Sea slugs need this adaptation because it is really difficult for them to find another of their kind. They are relatively slow moving animals that depend on feel and smell to get around. They don’t search around aimlessly for a mate though. That would be a waste of energy. The chances of finding a member of their own kind are greater near their favourite food. To make this clearer, imagine that you were someone who really loved eating pizza and you wanted to find someone else who loved pizza. The best place to find them would be at . . . a pizza parlour! For the giant nudibranch, you know from last week’s posting that they love to eat tube-dwelling anemones so they are likelier to meet a mate around this prey. They also may give off chemical signals (pheromones) to announce that they are in the area and “looking for love”. Compared to faster animals that can see though, the chances of sea slugs finding one another are much smaller. So when they do meet, it is important that they really make it count and have as many babies as possible especially since the eggs will hatch into plankton. This means that many baby sea slugs will become dinner for filter feeders like anemones and barnacles. How to have as many babies as possible? Both should lay eggs! This is why they are hermaphrodites; not just a male or female. The sea slugs line up right side to right side and exchange cells so that they can both lay eggs. I will share much more about the love life of sea slugs in future postings. Every sea slug species lays eggs that look very different. One of the “cases” I have worked on the longest is to figure out what each species’ eggs look like. A great clue in trying to figure this out is that sea slugs most often lay eggs on their food. 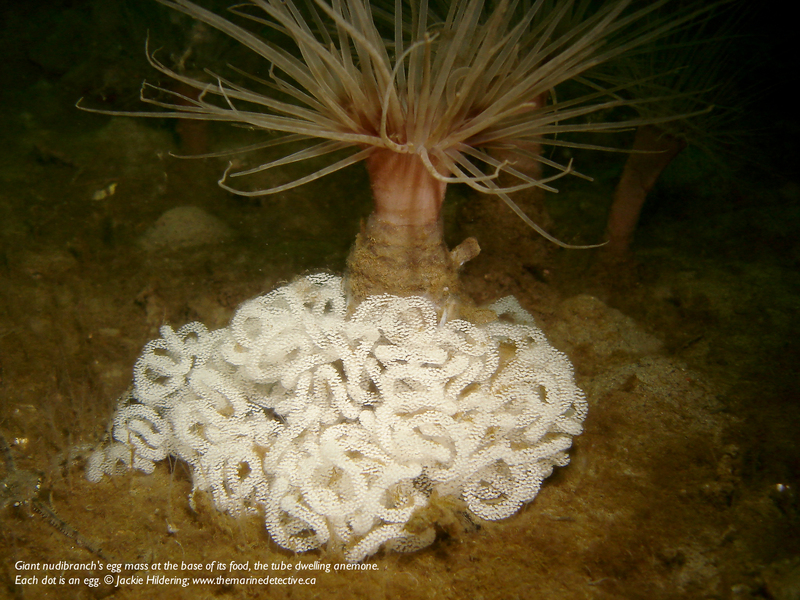 You can imagine my delight when I found a big mass of eggs at the base of a tube-dwelling anemone! Knowing that the giant nudibranch preys on this species, the chances were very, very good that these were its eggs. When you follow the link, you can see a larger picture of the eggs mass and get an idea of just how many eggs are in this string (each dot is an egg). I have also included video of the giant nudibranch swimming for your Easter weekend pleasure. You’ll see that the nudibranch swims upwards but, when it wants to go down, it just stops moving and gently drifts back down to the ocean bottom. You’ll also see that I am pointing my dive light at the animal and how this makes colours look different underwater. such cool video Jackie..and great information. I wonder how many from each egg coil (if any) grow to adulthood? Population equilibrium would be that of all the eggs laid, one survived to be able to spawn. So wonderful to be able to share these adventures with you dear dive buddy. Wow! Extraordinary! It’s quite elegant isn’t it. I’m looking forward to the next post. How wonderful to share this with you Yvonne. Extraordinary too that we would have this connection now after our teacher / student relationship so many years ago! Hi. I just checked out your website today, as I’m doing a theoretical proposal for my Marine Ecology class about Dendronotus Iris, and why they lay their eggs only at the base of tube anemones. You mentioned something in this post which interested me: You said that when the nudibranchs hatch, they become plankton, which anemones also feed on. So, while the nudibranchs lay their eggs on THEIR food source, they in turn are also a food source for the anemones? What type of interaction might this be termed? Parasitism in one sense, because the newly hatched nudibranchs will feed on the tube anemones, but if they’re also being eaten as plankton, then…what….mutualism?? Both get to eat each other? Please let me know what you think!! Really interesting thinking Savannah. I would not call this mutualism nor parasitism. To my knowledge, most sea slugs lay their eggs on or near their food and when you hatch as plankton, it’s inevitable that wherever you hatch, a large % are going to feed the food chain. A simplistic answer to your deeper question maybe but it makes sense to me that, for such a slow moving animal, you are not going to stray from your food source – it’s where you meet those of your kind to mate with; it’s where you lay your eggs; it’s simply where you are – near your food.